At school, I see teenagers who do really silly things in an attempt to keep up with the ‘cool kids’. Sadly those girls who will never keep up with the popular crowd often embarrass themselves trying to fit in and it all ends in tears. These wretched young ladies should have been more prominent in my consciousness when I asked Gillian to give me a sewing dare. I’ve been following the sewing dares discussions the ‘big girls’ have been blogging about for weeks but haven’t had the courage to engage…until now. I need to warn you: I think I’m developing a little blogging crush on Gillian. She is just so lovely and not remotely cliquey. Instead of just giving me something generic she came over and read my blog posts and even commented on one. What a thoughtful lady. Make a knitting bag for my projects using my new overlocker. Either zip, drawstring, or otherwise. In anticipation of the glorious serging gift I am expecting for my birthday I have now bought the Craftsy Online Beginner Serging Class. Then, unbelievably, as I was scanning through the lessons I found one of the projects the course teaches you to make is a box bag which I could enlarge and use for my knitting – now that, my friends, is fate! 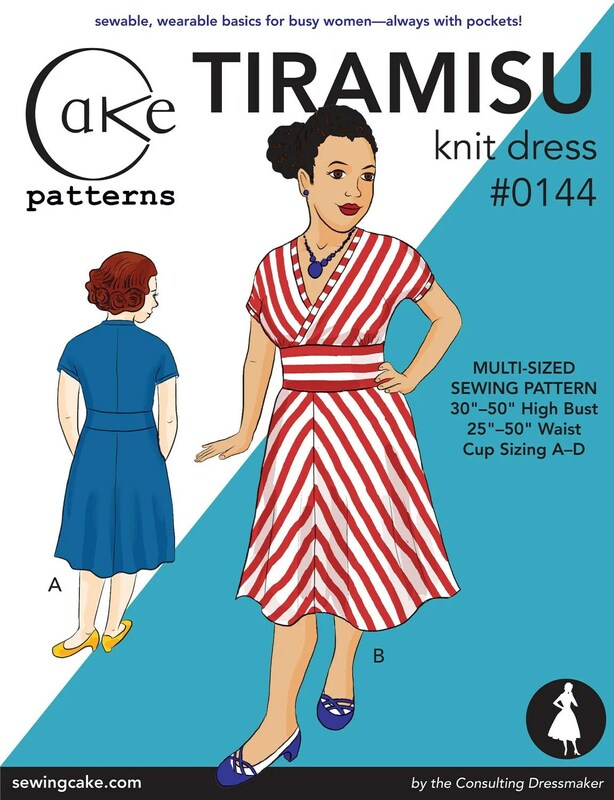 Cake patterns has recently held a thirty minutes a day sew-a-long for this pattern so I am buoyed by the chances of success with the additional help. I thought long and hard about whether to go for the physical Tiramisu pattern or the download. The PDF was just over £8 and the printed one £12 plus postage and packaging. I generally prefer the professionally printed product but calculated I could get the Maria Denmark one aswell for the same outlay by downloading the Tiramisu, so in the end there was no competition. Sadly I am having a complete nightmare printing this pattern to the correct scaling. I’ve spent an hour on it today before emailing Steph today with lots of screen shots to explain the problem. I really hope she gets back to me quickly as I want to get all the ‘pre’ work done so when I get my overlocker on Sunday I can get straight on. Can you imagine how bad it would be if Mr Frog *didn’t* buy me that overlocker now?! It doesn’t bear thinking about. Are you participating in the sewing dares craze? Is planning for ‘downtime’ a contradiction in terms? Are you a “fun fascist” like me or are you a free creative spirit? He took the christening to another level – by PEEING on Stitchy! This led to the cat being deeply unpopular for at least a day (could you resist the little swine!?) and the inside seizing up (machine, not cat). I phoned the Sewing Studio and as I had to travel the hour and a half from Plymouth and could only come at the weekend they made me an early morning Saturday appointment. Then, get this, as it was a quick fix they didn’t even charge me! I mean, what service!? So when my family offered to club together for my birthday this year so I could have an overlocker / serger there was only one place I would visit. Two weekends ago my lovely husband took me down to test drive some models and learn all about these machines. Personal one: would match Stitchy beautifully! Personal one: I don’t like the grey as much as I do the red! This bad boy looked amazing and apparently is a Bernina in all but name – they come from the same factory – but it was out of my price range so I didn’t dwell too much in case I fell in love! 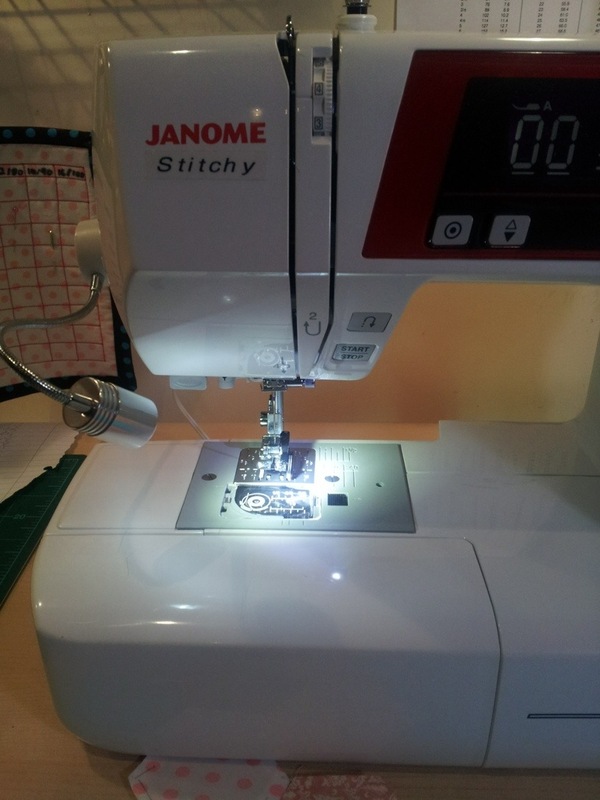 I decided to try out the mid-range Janome. Darius showed me the basic operation of an overlocker – in short you start the machine going and THEN start sewing to get a thread chain – and then he let me loose. First reaction? These beasts are fast! Wow! You can tangibly feel the increased power and speed from a sewing machine! I played with it for a while with Darius demonstrating the features and then asked him to change it to three thread, two thread and finally rolled hem. He was quite happy to do all he could to answer my questions and demonstrate anything I asked. It was great to try everything and he was so knowledgeable. The shop has a lovely cafe inside with the holy trinity: muffins, magazines and material – who could ask for more!? After a lovely cuppa we went back to where I had been playing with the overlocker and I began playing with it on my own while the shop assistants were serving other customers. Call me silly, I am, but this is when I started falling in love with Her. Darius kept talking about the machine like it was, well, a machine! Hey,he is an engineer to him that’s what it is. But to me, it needs to be so much more. It was this time I spent alone with it, playing with it, accidentally breaking the threads (and turning it in to a nest!) that made me feel this was my new baby. Bless him, Darius had the patience of a saint, rethreaded it and answered all my questions when he came over.We had a great experience and everyone was so helpful. I came home to research my shortlisted machine. There were hardly any reviews, which felt strange as the design of the machine wasn’t particularly modern. After a little digging and I quickly found this machine used to be called the 634D which had lots of good reviews. Particularly as a mid-range model, it means I can begin as well as grow on this baby. So I put in my request to the birthday fairy for the Janome 6234XL – they were on sale until today so I hope he bought it in time! Have you got a serger or overlocker? Do you like to ‘fall in love’ with machines, or are you more interested in sepcifications? I’d love to hear from you! 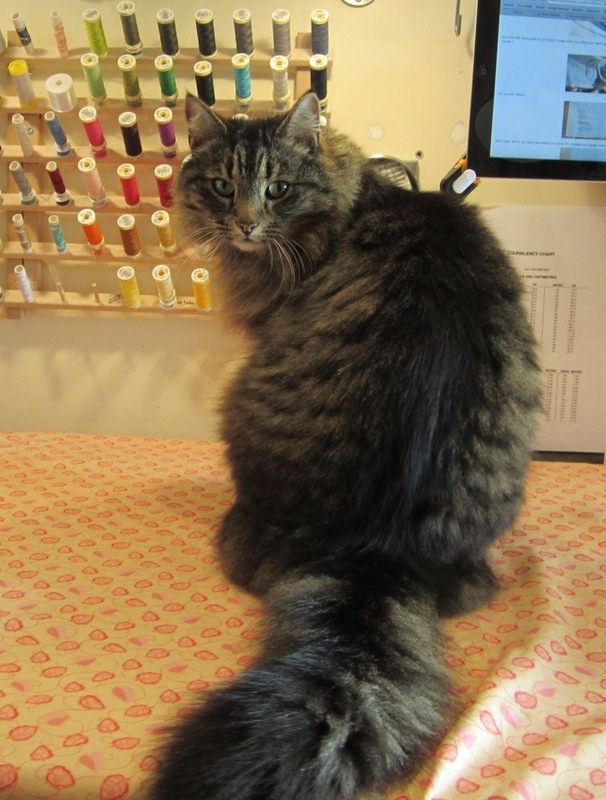 I wanted to say I am not affiliated to The Sewing Studio – just impressed! I think I got away with it!? Okay so I finally got up the courage to wear something I have made out with someone other than my husband or closest friends. I decided that it was a baptism of fire so I wore it out for my cousin’s birthday meal at the very cool River Cottage Canteen in Plymouth. I am so proud to say that I think I got away with it! I don’t mean I ran off without paying the bill – I mean I think nobody realised my top was handmade not ready to wear. Very very exciting. So I suppose this answers the question posed by Sewaholic a few weeks ago in her blog how to make your clothing look less homemade. I am clearly in the camp of people who want their clothing to look as good as RTW. 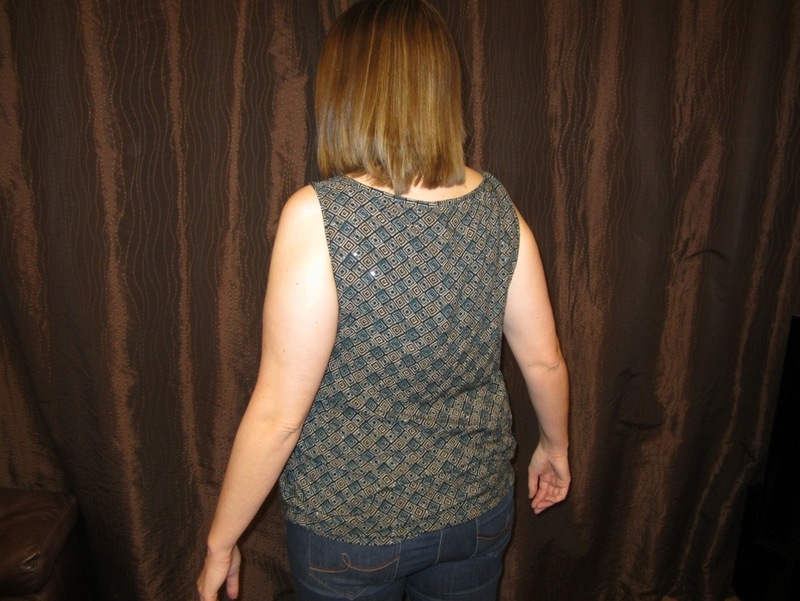 Now this is doubly exciting because I actually altered the pattern a bit – I lengthened it. I commented on Gillian of Crafting the rainbow’s blog that I couldn’t alter a pattern and she came back telling me to just go for it – and she was right, scarily so considering she commented after I’d made this! It was cheap fabric (£3.99 p.m. At local discount store Trago Mills) so I thought the learning would equal the cost of the fabric if I mess it up. The truth is, I did mess it up, because it was so long it was ridiculous! So I decided to make it a gathered bottom like some of my M and S tops by elasticating the bottom. I like it, it gives it a different look I think. This make came together so quickly and easily, I did it over two weekday evenings and I am not up to much on weekday evenings. I didn’t pay full attention to the instructions (theme here!?) and didn’t bind the armholes properly – you are meant to sew the binding in to a loop and then bind the sleeve but I just bound it as a straight piece and it look ridiculous. I back tracked, realised my mistake and it dawned on me very quickly that I couldn’t be bothered to fix it properly so I just increased the seam allowance to take out the extra room. I did take a photo of me showing the offending armholes but I am not confident enough to put my ARMPIT on the information superhighway yet! I really like the project and will make more of these tops, so versatile. What did you make this weekend? Do you like people to realise stuff was homemade? Or do you prefer them to mistake it for RTW? 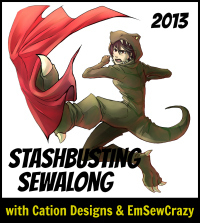 Well throwing myself in to this online community mullarky I have joined Stashbusting Sewalong being run by Cation Designs. This is the first sewalong I’ve ever participated in – exciting…? Well I think so! Although I have only been sewing a year I don’t have a great fabric shop nearby so tend to ‘stock up’ whenever I get the opportunity. Also I’m a a bit of a ‘fabric tourist’ so like to pick up some fabric, or notions or something whenever I am away… This means I have accumulated a fair amount of fabric – my husband would say it is a lot! The issue I have is that the fabrics I have don’t usually match the patterns I own, and I really don’t have the confidence to go off piste with fabric suggestions! The upshot of this is that I end up having to buy a specific fabric for a specific project leaving my poor stash looking dejected and unloved… For me the challenge of this sewalong will be to buy some patterns to match the stash – rather than just buying the patterns that catch my eye in an utterly haphazard fashion based on my mood/price/confidence level in my own skills that day/insert other random factor here. I am really looking forward to tackling a challenge as an online community and hope this will motivate me to achieve the goal! Are you participating in the sewalong? Are you a fabric tourist too? Or, on a more practical note how do I out something on the sidebar!? I’d love to hear from you. I am pondering this quote as I write my first blog post to nobody! 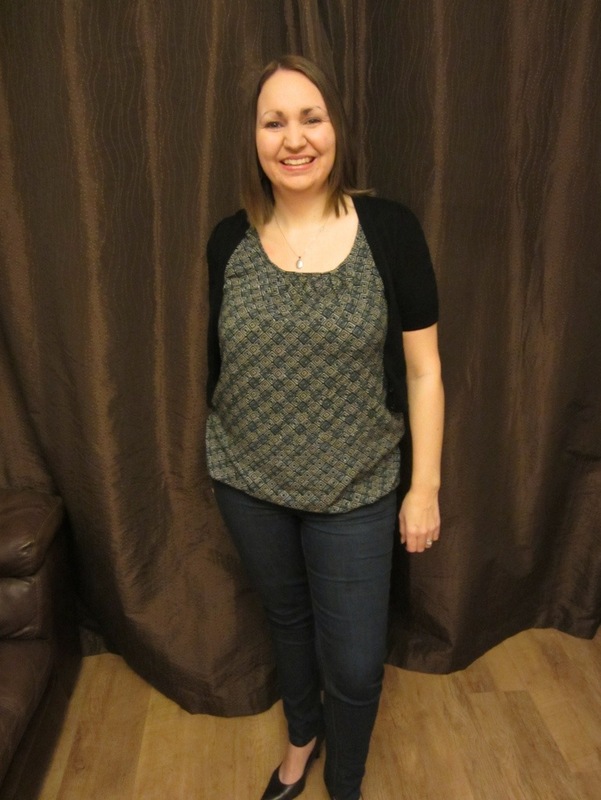 Welcome to the beginning of my online chronicle of my sewing and crafting hobby! However, another naff quote, each journey begins with a single step, and you need a good pair of socks for a long walk! Okay so what did I sew this weekend? 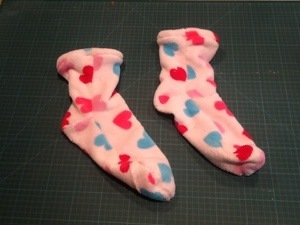 Well I had a go at a free pattern from Maria Denmark and I tried the super socks. As I go to put this link in I see that you now need to pay $2 for the pattern on Craftsy it was free when I got it last week – perhaps it was on special offer? 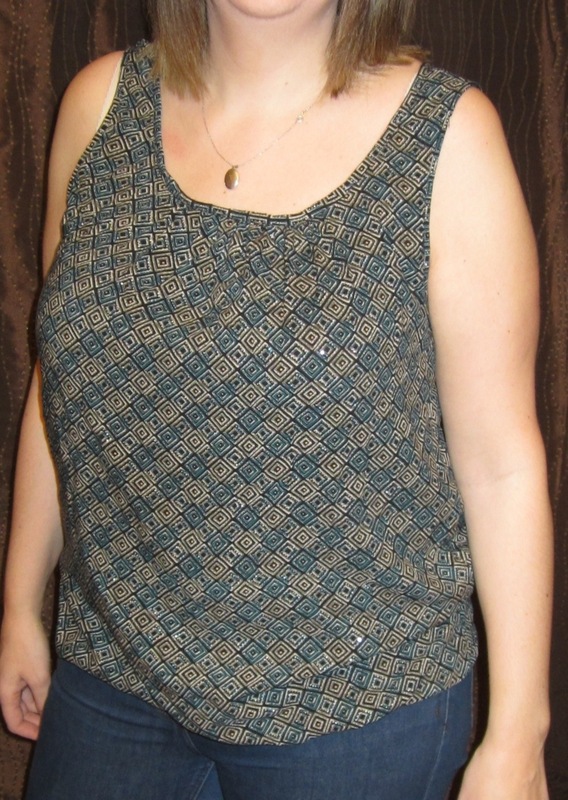 The reason I wanted to try a Maria Denmark was because I wanted to trial her patterns as I am quite taken with the day to night top which seems to have great reviews from blogging idols Scruffy Badger and sew busy lizzy but I wanted to check out how good the patterns and instructions are. I also wanted to see what it was like trying to add the seam allowances to a pattern and if this was beyond me. I have this fleecy fabric that I found on a visit to Walthamstow market (world renowned thanks to Karen of did you make that? fame) which I haven’t known what to do with. It seemed perfect for a fluffy sock or two. I didn’t do a toile, I thought the pattern was pretty simple and, seeing as they are only for my feet I would make whatever they turned out like work! Printing and sticking the pieces together was fine, it seemed my printer shaved a few millimetres off the bottom of each sheet but I just eyeballed it. I then made a stupid error and forgot to add the bloomin’ seam allowances! To compound this, I didn’t realise until I had cut the fabric! Oh what a silly I am! So I think to myself – ah well I will just use the mock ‘overlock’ on my sewing machine and see how it goes. This pattern is super simple. Two pieces, you sew the heel shapes and then the top and bottom bits; that’s it. Very satisfying as they are so quick. As it turned out the seam allowance didn’t matter – they fit just like a glove and are very comfortable. The end product isn’t a ‘real’ sock in that it has seams; I think if you wore these out of the house for the day you’d end up with the seams rubbing your feet. 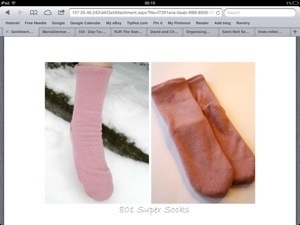 Having said that I really like them as ‘house socks’. 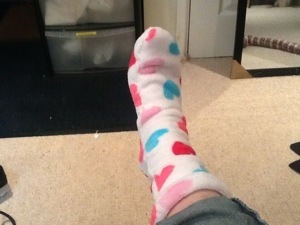 I get really cold toes and have made these out of the fluffiest fleece so putting my feet in to them for plodding around Chez Bobbins is just lovely! I found the top a bit loose on my first attempt so did a second one with pink foldover elastic – omg did I find that hard! I need some remedial FOE lessons! They are okay but I think I preferred the ‘hemmed’ top. I’d recommend this pattern, quick, easy and fun. Perfect for beginners.